High cholesterol poses a health risk to men and women. Your health care provider may recommend restricting your cholesterol intake if you've been diagnosed with elevated blood cholesterol. Knowing how much cholesterol is in food items plays a crucial role in meal planning. In general, fish and other seafood provide health benefits. 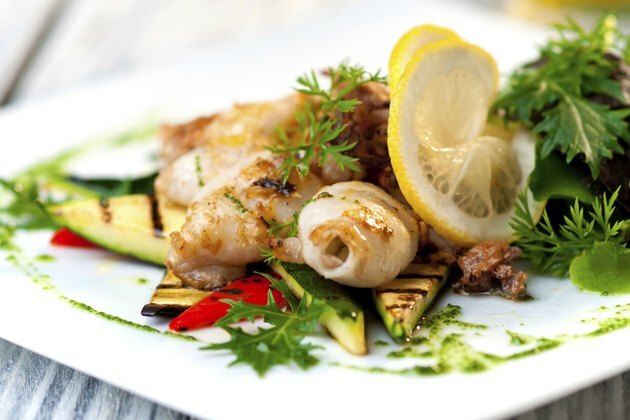 But squid may not be a good option if your physician has instructed you to adhere to a low-cholesterol diet. If you're healthy, aim to consume less than 300 milligrams of cholesterol daily. Limit your cholesterol intake to 200 milligrams per day if you have heart disease or your LDL cholesterol is 100 milligrams per deciliter or above, recommends the American Heart Association. Squid is a high-cholesterol food. A 3-ounce serving contains 198 milligrams of cholesterol. This is close to an entire day's worth if you are in an at risk category. Because this represents a small serving, talk to your doctor about whether you need to avoid squid. Are Mussels High in Cholesterol?